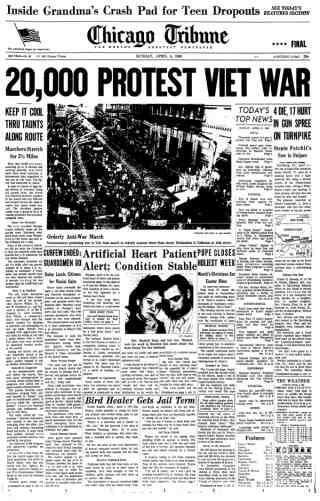 April 5, 1969 -- More than 20,000 people march down State Street in opposition to the war in Vietnam. As the march assembles demonstrators are given printed instructions to cooperate with police and ignore counter-protestors. A select group of 800 Chicago police officers are also instructed to show courtesy to the marchers. The only major disruption comes at Fourteenth and State where a protestor and counter-protestor get into it with each other. 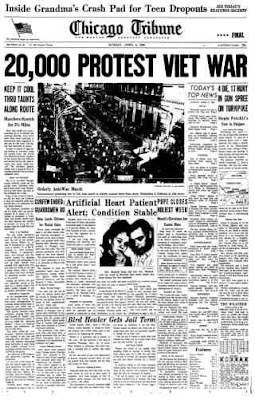 National Guard troops, already in the city because of incidents stemming from the anniversary of the assassination of Dr. Martin Luther King a year earlier, are not needed.